Opening and closing clothes pegs is a fantastic way of developing a pincer grip, to help future pencil control and grip. (A pincer grip is when we use our thumb and pointer finger to hold items). This Montessori Activity is designed to encourage children to develop their pincer grasp and finger muscles, and to improve their hand-eye coordination. Attach pegs all around the container, leaving a small space between them. 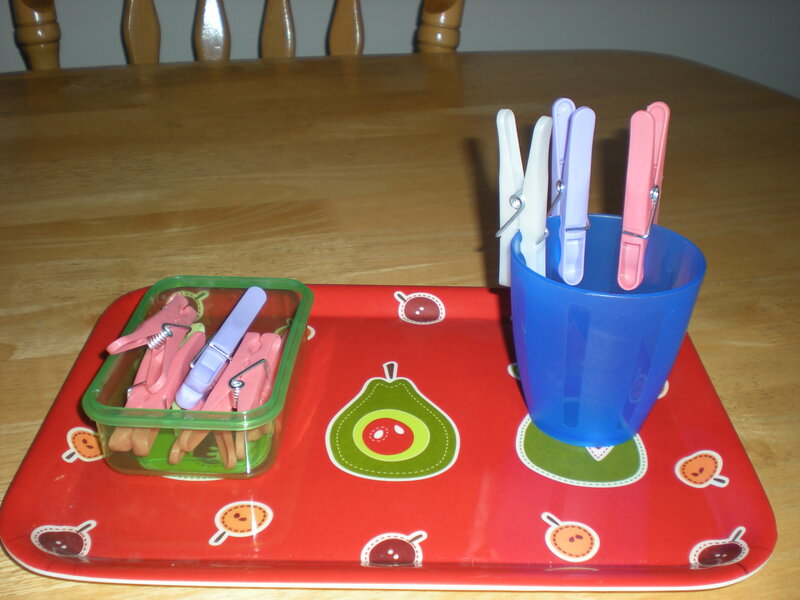 Count these pegs into a container for your child to use and take away the rest. You may discover that your container toppled over, oops! Usually heavy plastic bowls or melamine are best. You will find the perfect one through trial and error. The aim of the game is to try and place all of their pegs around the bowl. Pegs are then removed, one at a time, and returned to their original container. Try and set this game up so the container of pegs is to the left of your child. This will help to internalize left-right orientation (the reading and writing direction). By passing their hand across their mid-line (or belly button) your child will engage both the right and left hemispheres of their brain. Montessori stresses very strongly that you should show a child how to use materials and then walk away and allow them to practice it for themselves. An activity such as this demands lots and lots of concentration and practice. By staying with your child you are not actually helping them at all. Without talking (that’s the trickiest bit! ), place the container of pegs to the left and the empty bowl in front of you. Start attaching the pegs around the bowl. When you have used all your pegs start removing them, one by one , and returning them to their original box. Ask your child to see if they can attach and remove the pegs the same way you did. Encourage your child to see how many pegs are still left in the box. Explain that with practice they will learn to empty the bowl ;). Now that your child knows what to do you should just leave them alone to play and learn. It’s that simple and ridiculously good for hands! It’s also a transferable skill to your washing line if you need some help in the future. Sneaky, eh?